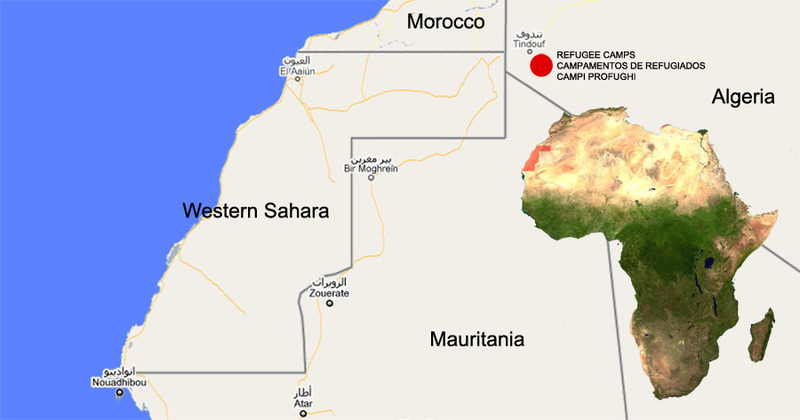 Close to Tindouf, within the Algerian territory, at a very short distance from Western Sahara and Mauritania, there is a border zone which has been home to 200,000 sharawi refugees for more than 42 years. If you take a walk around the refugee camp, you will never feel alone, meeting people, children wanting to know your nationality or asking for candies, people stopping to talk to you and others who will just say hello without even stopping; most people will offer you some tea, the mark of hospitality for saharawi people. It would be polite to take at least three cups. The first one tastes bitter as life, the second is sweet as love while the third is soft as death. You came from a distant place for a very important reason, to promote more awareness of the health and food needs of Western Sahara children. The route symbolically connects the three refugee camps of Smara, Auserd and ElAyoun, and leads runners through a desert which has been the home of refugees for 42 years. Thanks to your effort and your concern for this issue, you have reawakened their hope, giving them the feeling of not being alone. But what is more important is that, as you decided to go there, they can now count on new friends all their lives. For this reasons, after several attempts, we have reached a formula that guarantees the sustainability of the Sahara Marathon and its projects: the registration would cost € 225 per participant. – 100€ are fully assigned to the expenses at the camps, as an aid to the families for their hospitality, to give economic aid to all Sahrawis participating in the organization, and to cover all the costs of the services, such as transport. – 75€ are for the race expenses such as materials, T-shirt, medal, water and staff employed on the day of the race. – 50€ are destined to a common sports project, to be implemented during the year. It can be a building, such as the sports school of Smara, the purchase of sports materials, or the organization of sports teams and sporting events. The overall fee includes the payment for the charter flight, insurance and visa. In the flight we have to cover also the cost for the medical staff, the Saharawi invited runners and some journalists. Once we have paid the flight, purchased all the stuff needed for the race and covered all the expenses at the camps, the surplus money goes directly to different solidarity projects. The international group of volunteers who works in the organization of the SaharaMarathon does it for free, and everyone pays by himself all of his expenses. The SaharaMarathon receives no subsidy, apart from those of its participants. All this can be achieved thanks solely to your participation fee and your help, which is not the price of a simple race, but an experience of a week and a long-term project. It’a matter of getting there together, or not getting there at all.